Munich - Mario Götze's return of two goals and three assists from his last three games for FC Bayern München is all the more impressive given that the record champions' star summer signing from Borussia Dortmund was only on the pitch for 139 minutes all-told in those three outings, including just over an hour of Saturday's 3-2 win against Hertha Berlin. 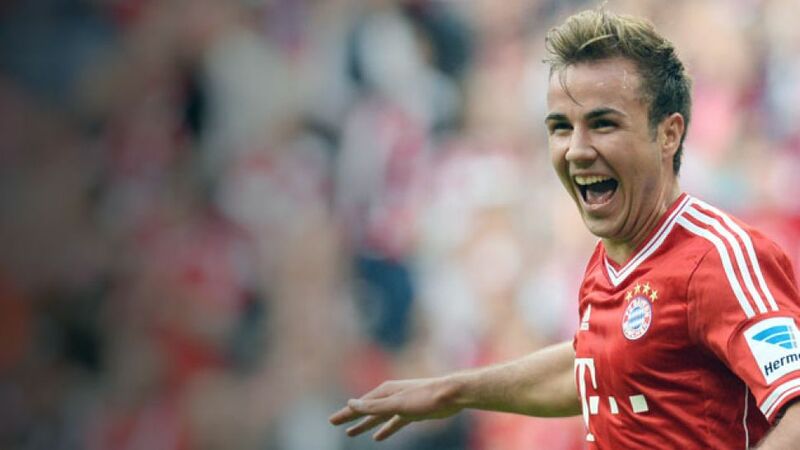 He hit his first competitive goal in a Bayern shirt against Viktoria Plzen in midweek to round out a 5-0 UEFA Champions League success, yet his most important contribution so far was his first Bundesliga goal for the Bavarians, which proved to be the match-winner against Hertha. “I’m obviously very happy,” said the 21-year-old attacking talent after the game. And so he should be. His 54th-minute header found its way past stricken guest keeper Thomas Kraft in what seemed like slow motion. The most pertinent aspect of the finish, however, was the fact it was a header at all - and only the second of his 23 Bundesliga strikes to date. “As long as the ball goes in, I don’t mind how,” he smiled. “Hertha are a very good team,” Robben continued. “They’re very aggressive, they got in behind well and made it really difficult.” Indeed, Adrian Ramos’ fifth goal of the campaign arrived in the fifth minute and set Bayern the task of coming from behind once again. It was a challenge they grappled with for 25 further minutes until Mandzukic nodded a Franck Ribery cross in at the back post. The Croatian then completed his eighth Bundesliga brace in the 51st minute, before Götze’s header put the hosts 3-1 ahead. Hertha struck back through Änis Ben-Hatira just four minutes later, however, making it a nervy last half-hour for Guardiola’s troops. Former Hertha defender Jerome Boateng was lavish in his praise for the men from the capital: “They played really well. Compliments to coach Jos Luhukay and his team." Boateng also lauded the impact of Bayern's substitutes, adding: “It’s very important to have options from the bench." Guardiola may have been forced into using two of those options earlier than he may have wished owing to injuries, but the Catalan coach had one remaining ace up his sleeve: compatriot Javi Martinez. The Spanish defensive all-rounder's entrance calmed Bayern just after Ben-Hatira’s strike and helped them re-establish control. Like Götze, Martinez has slowly been making his way back to full fitness after picking up an injury in the .